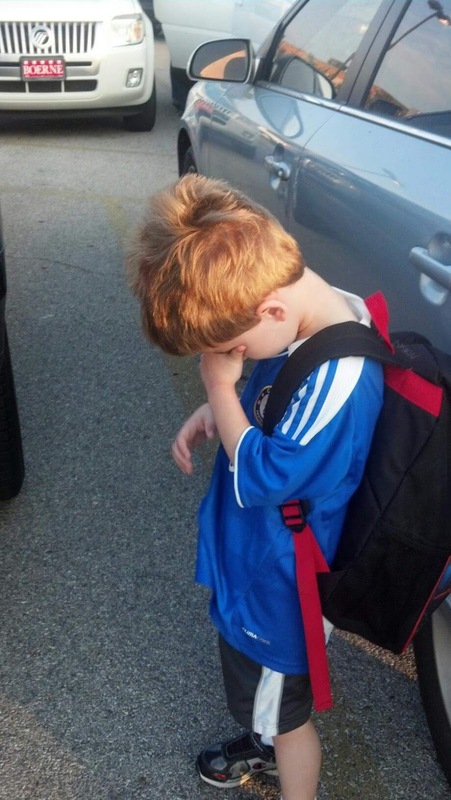 Many moms do a happy dance when their kids go back to school. They get their alone time back, after all--what's not to love about that? I work in a school district, however. I've been at work since the beginning of August, so I don't get the alone time. And my son just started school this past week. I am not a fan of some aspects of the back to school experience, however. It's kind of difficult working in a school all day and then coming home to more school in the form of my child. I'd rather do just about anything else, even clean toilets, than think about school when I am at home. But that's what being a parent is about, so I grit my teeth and deal with it. Still, there are at least six reasons that I am not a back to school fan. 1. School supplies I've written about my annoyance with school supplies. My husband and I carted five bags of school supplies up the stairs to Zane's classroom, only to be told that we didn't need all the things we had purchased. It was lucky for the teacher that I was too tired to lift my arm; I wanted to punch her, just a little. (I'm kidding--most teachers can bench press a seven year old. You don't want to mess with that.) I know that schools need the supplies, but I would rather not deal with it. 2. Socializing. 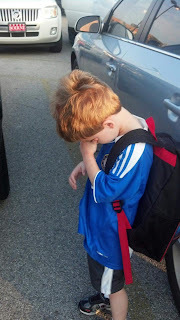 Every year, the last day of school has Zane crying for a few hours because he won't get to see his friends over the summer. He has a more active social life than I do, what with all the invitations to birthday parties and requests for his hand in marriage. Whenever I find an invitation to a party in Zane's folder, I cringe. I feel that I just don't do well in the mom groups that attend these parties. I am older than everyone else, and it seems as though I have nothing in common with these women. They're young, just starting their families. I usually end up standing around these parties, the perennial wallflower. It's high school all over again. 3. Learning the rules. Every teacher has their own method of classroom management. This can be confusing. Not only does my son have to learn a new routine, Larry and I are stuck learning the same routine, so that we can help our boy, at least at first. Sometimes I take it personally, I know. This week, because Zane had soccer practice this week, we thought it would be good to have him get two days' worth of reading on the day in between his practices. That was not the right idea, it turns out. Zane came home and told us that he had to do "extra" reading as a consequence of reading ahead. 4. Behavior charts. I understand that it is important for teachers to communicate with parents. I like the idea of behavior charts. Zane brings home a behavior chart every day, and he is given a color to indicate what sort of day he has had. I don't believe this particular behavior system is appropriate for my son. One little moment of forgetfulness, and Zane comes home with a 'bad' day. It is just too difficult for him to be on constant guard for his behavior. He comes home frustrated, and I don't blame him. 5. Homework. When kids are learning a new concept, they need to practice. They need to work on automatizing the concept, like multiplication tables. Zane doesn't want to do homework. I don't want to do homework, and neither does Larry. Yet both of us find ourselves sitting at the table next to Zane, redirecting him back to his task many, many times, until the homework is done. On days when we have other obligations, such as soccer, homework becomes a hassle for the entire family. 6. Juggling schedules. Not only do I have to think of my work schedule, and my radiation therapy schedule, I have to keep track of my husband's schedule as well as Zane's. Each person's schedule is different. Larry's days off are not always matched with mine. Zane's days off don't always match either of us, which requires me not only to find alternate accommodations, but to get Zane to this new destination before I have to be at work. I'm horrible in the mornings. I don't move fast, I am groggy, and I have difficulty putting together sentences. That's not a recipe for good time management, and so I dread those days. Is there any part of back to school that you're not happy about? Labels: Back to school, children, OMG what the heck am I doing? this behaviour chart thing scares me.. I mean small things making the whole day bad .. is it any good that way to monitor always ? I've always hated the behavior chart....sometimes I got the feeling the teacher gave Sean a bad mark because she had a bad day & didn't like him anyway. He's had a lot of those. Fortunately it does get better into middle school. I don't like the syllabus that comes home 1st day of school for the 1st semester. They never adhere to it so why bother??? ?